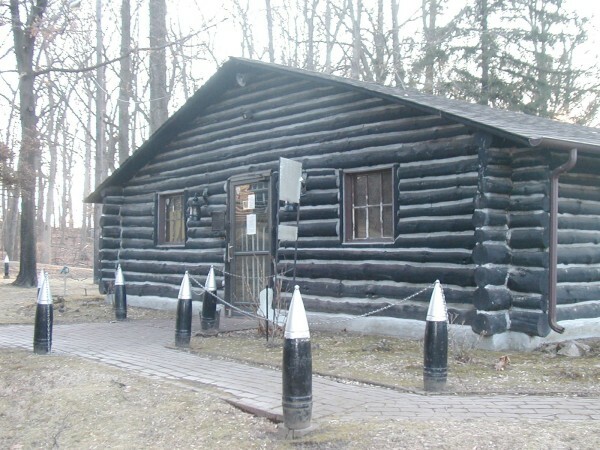 (the same shells which were used against the soldiers of the 314th Infantry). Thank you for your e-mail of June 25 regarding the identification of two shells. These shells are from a German 17 cm Naval gun of the First World War period. The marking of a crown above the letter M is the Imperial German Naval acceptance mark. The mark VI 18 is the manufacture date, June 1918. 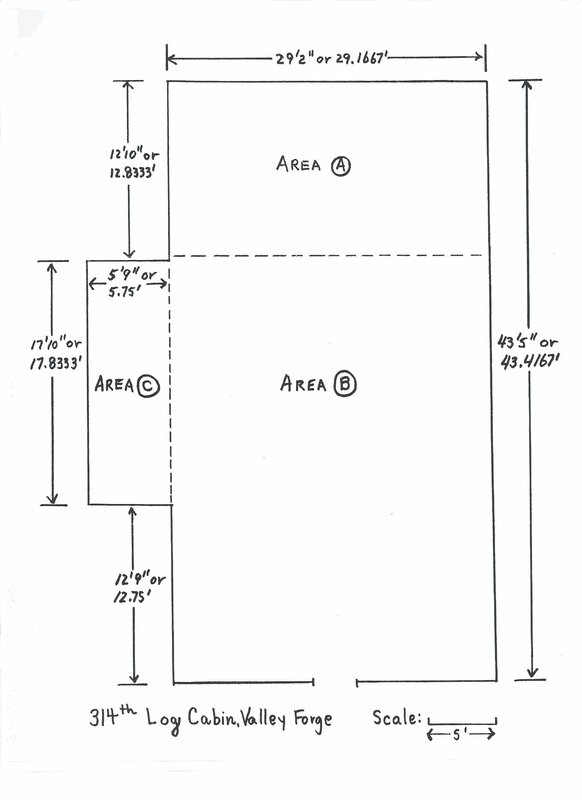 The other marks are inspection marks and production batch numbers. The German navy used guns of this caliber from the late 19th Century and during the First War some of these weapons were taken into service by the Army and mounted on wheeled carriages for use as heavy field artillery. 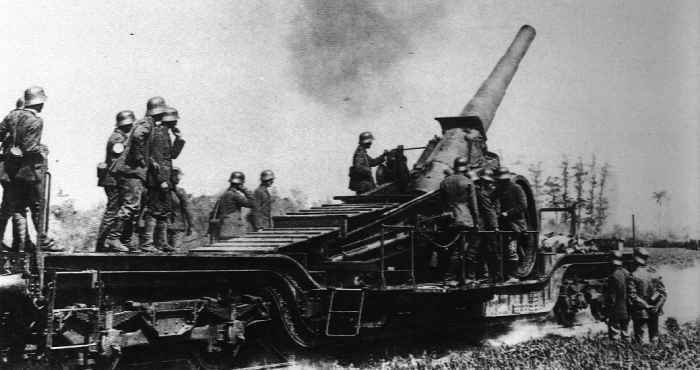 Some of the guns, complete on the carriage, were placed on railway mountings and used as rail guns. The normal ammunition was High Explosive [HE] and could be fired to distances up to 24 kilometers. I hope this will be of help to you. 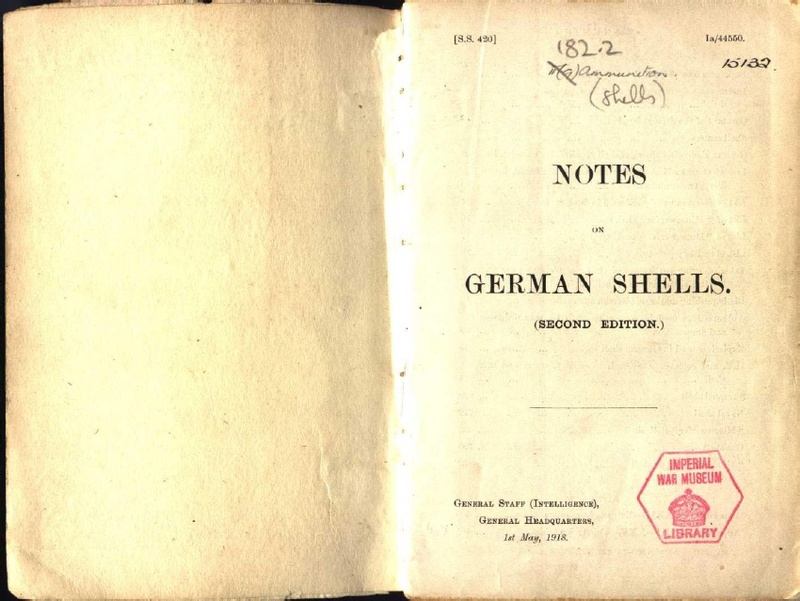 Pages 312 and 313 from the Book "Notes on German Shells"
PDF saved as a copy, May 1918 version from Imperial War Museum Library. The recoil was allowed to propel the gun (railway car) 100 feet down the tracks in order to disperse the massive recoil energy. 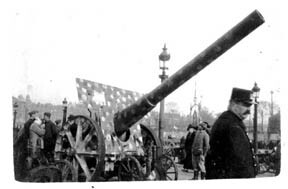 German 17 cm Naval Gun as identified by Dr. W.F. Atwater. This is a German 17cm Naval Gun used by the German Army. In this photo many details show up. Most noteworthy was the lamp posts that I used to compare to those in the photo of "Paris November, 1918" that I got off the web. The Man in the foreground looks to be that of an French Policeman, maybe he is a Paris policeman. Note his flattop hat with a badge on the front and his mustache. Behind him can be seen a French Soldier and a woman dressed in a long coat wearing a wide brimmed hat. In the very farthest background on the extreme right side of the photo can be seen the sand bagged structure covered with the German Army helmets again. To the left of this is the bridge with the German airplanes on it. As to the gun the camouflaged paint job seems to be just daubs of light paint over the whole gun like polka dots. Behind the gun can be seen another French soldier who appears to have his head in a bandage. Behind him is at least 3 American Doughboys.